Mannheim, German territory: The preparations had been completed, around 30 young people once again adjusted the tables and waited for the first guests. On Saturday, January 19, the opening ceremony of the “Ewwe longt’s – Linkes Zentrum Mannheim” (leftwing center Mannheim) was to begin at 2 pm in Kobellstraße. The first guests were already there, including some children. But suddenly about 15 young people ran into the shop, many with black rain jackets and hoodies, which apparently did not come to celebrate. Originally published by Kommunal Info Mannheim (KIM). Edited machine translation by Enough is Enough. Among these people, including a woman, were some familiar faces. When a rally for rescue at sea in Heidelberg was disturbed, a similarly composed group had caused riots. People acting under the label “Identitary Movement” (IB) repeatedly cause a stir. Also present: Leon Stockmann, member of the state executive committee of the youth organization of the fascist AfD: “Junge Alternative”. Yesterday KIM had reported about him. The people in charge of the “Ewwe longt’s” immediately spoke out a ban for the house, but the group did not want to leave. In front of the shop there was a war of words and pushing on the street. Then the far right activists started to spray pepper spray on visitors* inside the “Ewwe longt’s” and ignited a Bengali fire. Pepper spray was also sprayed on the employee of the KIM who was watching the event. Meanwhile a riot police squat came running along the Kobellstraße from direction Käfertaler Straße. There were two police vans positioned – the police had already counted with a possible attack in advance. 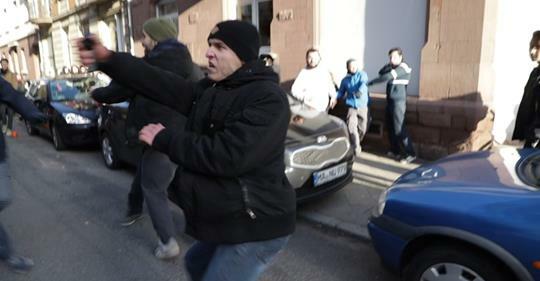 The “identitaries” ran away, only Leon Stockmann and another one stopped. Apparently he was waiting for his girlfriend, who had stayed behind alone. Leon Stockmann, official in the state executive committee of the “Junge Alternative” was checked and searched. In the Neckarstadt-Ost a car chase took place. Riot police ran after the presumed “identitaries” and could seize some. On the spot, Ralph Hartmannsgruber, the head of the police station, reported to KIM that the police were able to catch five people and that they were now carrying out ID checks and searches. Leon Stockmann was checked by the police a few metres next to the “Ewwe longt’s”. His backpack was searched. In the “Ewwe longt’s” peace slowly returned. The whole incident lasted only a few minutes. Some guests were injured by pepper spray. The children were fortunately all in the building and hardly noticed the incident. Little by little more guests came and the program for the opening ceremony could start as planned at 3 pm. An attacker is taken away by cops. In the evening the police explained to KIM that they investigate because of severe bodily injury and offence against the explosives act by the attackers. In the course of the further search, a total of nine persons were checked. They all became a ban for the premises. One of them had been taken to the police station to be identified. Two cans with pepper spray were found during the searches. The investigations continued in the evening. A report about the opening ceremony of the “Ewwe longt’s” follows in the KIM.